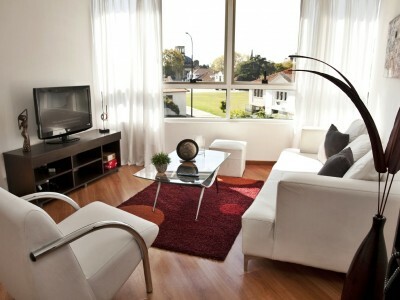 “Palermo View” is a brand new luxury condominium complex in the trendy neighborhood of Palermo Hollywood. 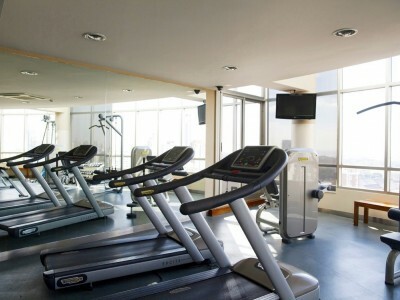 This modern high-rise building offers a wide range of amenities: 24 hours security, an spectacular outdoor swimming pool located on the ample rooftop terrace offering amazing panoramic views of the city, laundry, gym, sauna, and parrilla. 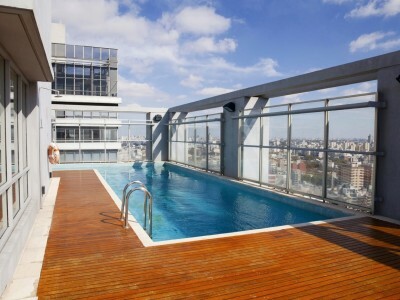 The upscale building is surrounded by a selection of Buenos Aires' most famous and finest restaurants, bars and pubs. Within walking distance, chic boutiques and art galleries scatter the streets alongside markets, outdoor cafes, bakeries, banks and various other specialty shops and services. 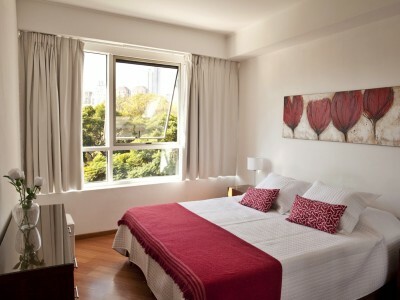 Furthermore, Palermo Soho, Belgrano and Las Cañitas are just minutes away by foot or taxi while a nearby subway can take you throughout Buenos Aires and surrounding areas. 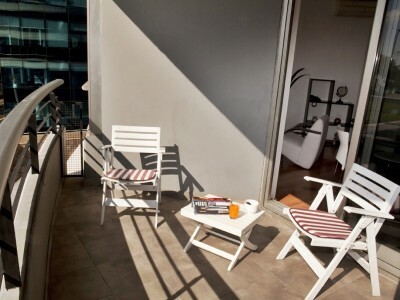 This unit, located on the 2nd floor, offers a nice view, as well as high-speed Internet Wi-Fi, air conditioning in each room, LCD cable TV, and complementary cleaning service once per week. 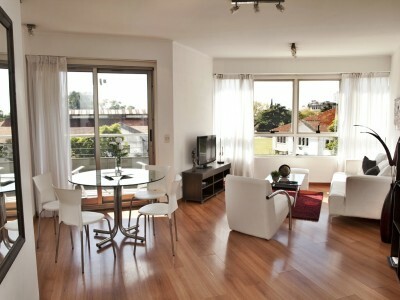 -LIVING ROOM: the living room has been decorated tastefully with a comfortable sofa, a coffee table and armchairs. Dining table with four chairs. Full of light. LCD TV with Cable. Wooden Floors. Air conditioning (hot/cold). 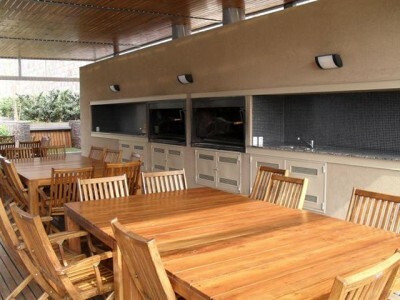 -BALCONY: The balcony can be accessed through the living room. There is a small table with two chairs. 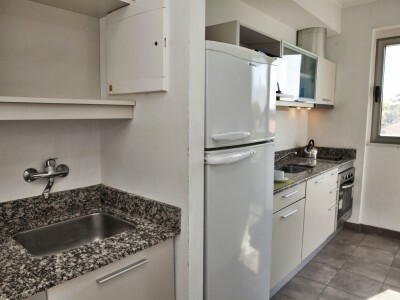 -KITCHEN: fully equipped with fridge, oven, microwave, electric toaster and complete tableware for four people. -BEDROOM: the bright bedroom features a queen-size bed (1,60 x 1,90), two night tables and reading lamps. Closet. Wooden Floors. Air conditioning (hot/cold). 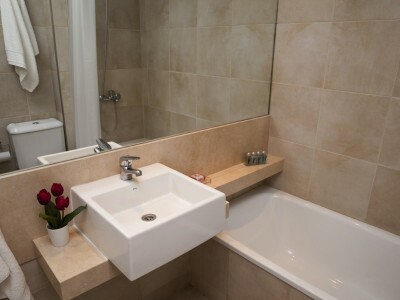 -BATHROOM: The modern bathroom has a bathtub with shower. Hair dryer. -TOILETTE: full equipped guest toilette. These rates are final in USD; they include: building expenses, electricity, water, gas, local phone calls (control line for limited local calls), cable TV, Wi-Fi internet access, cleaning service once a week and taxes.